Finnish National Opera House – Helsinki.. Founded in 1911, Finland’s national opera company was originally known as the Domestic Opera and then the Finnish Opera until a name change in 1956 when Finnish National Opera (Kansallisooppera in Finnish) was adopted. Although opera has been performed in Finland since the late 19th century, the opera company was without a permanent home until 1993. In 1918, the Finnish Opera was temporarily based in the Alexander Theatre, an old Russian theatre on Bulevardi in Helsinki. Finland’s opera house seemed to have been fated with long delays at every stage. A proposal to build an opera house was first put up in 1920, the design by the architects Hyvämäki-Karhunen-Parkkinen was done in 1977, but it was not until 1993 that building of Finland’s first opera house on Töölönlahti Bay was finished. This modern-design opera house facilitates ballet performances as well in its 1,350-seat main auditorium. The Almi Hall seats another 200 to 500 people, depending on the configuration. Modern stage technology allows the stage to be rotated, raised or lowered as required by the set designer. The orchestra pit can also be raised, lowered and re-sized according to the number of musicians in the orchestra and the acoustic effect required. 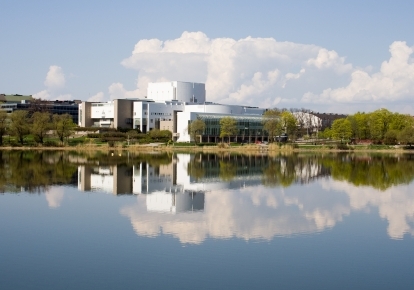 The glass wall of the main foyer opens out towards Töölönlahti Bay and Hesperia Park giving opera and ballet-goers views of the beautiful bay area at interval time. The Kanresta Opera restaurants caters to the refreshment needs of visitors to the Opera House. The FNO is conveniently accessible by public transport. Trams 3T, 4, 7A/7B, 8 and 10 and several buses stop right outside the Opera House. And if you’re looking for hotels near the Opera House, the Crowne Plaza and Scandic Continental are close by.